One of your primary jobs as a parent is to teach your children to make smart choices for their lives: socially, mentally, emotionally, and physically. But while you do that, you are the one responsible for caring for your children’s health, including their teeth. 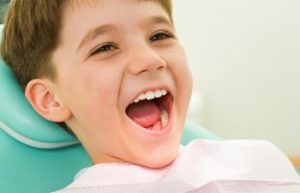 There are three easy ways to help keep your son’s and daughter’s teeth healthy until they can take care of them on their own. 1) Teach Them to Brush And Floss: Brushing doesn’t have to be a chore. Even at a young age, you can get your child involved. Let her have a turn to brush before you follow up after them for a thorough job. Give him an opportunity to pick the toothbrush and toothpaste and to fill the cup at the sink. As they get older, back off slowly so they develop good brushing habits, yet still have supervision. 2) Fluoride Treatment: At Dunwoody Family & Cosmetic Dentistry, we give parents the option of having a fluoride treatment for their child. Fluoride helps keep teeth strong, remineralizing areas that have weakened. It can strengthen baby teeth, so they aren’t prone to developing cavities, and it strengthens the permanent teeth as they grow in. 3) Sealant: Dental sealants are a thin plastic coating for your teeth. The back teeth are full of nooks and crannies; they’re difficult to clean, especially for kids who aren’t particular about brushing! Sealing the back teeth can help prevent cavities in the teeth that have to last a lifetime! Talk to your Dunwoody family dentist about more ways to help your child have healthy teeth for life. Call to schedule an appointment today!